Five months after suffering a stroke, Joseph Lape is walking out of Madonna and driving home by himself— with no restrictions. "I was in a wheelchair, I was in a walker, graduated from that," said Joe Lape, a stroke survivor. On this April day, graduating from driving school. Joe says back in October 2017 he felt the effects of a stroke coming on. "I told my wife, I said, ‘Honey, I think I’ve had a mini stroke,'” said Joe. Hours later, tests at CHI Lakeside Hospital confirmed Joe’s stroke, affecting his right side. Recovering at Madonna’s Omaha Campus, the ordained minister and former chaplain says singing and strumming Gospel songs fueled his recovery. "I had the chance to share the love of Christ with so many people. I forgot I was sick,” said Joe. Along with his love of playing guitar, Joe says therapists also tapped into his passion for golf. "Instructors had me bring my putter up here. One day we did some putting. And it was fun, but it was part of my therapy," said Joe. 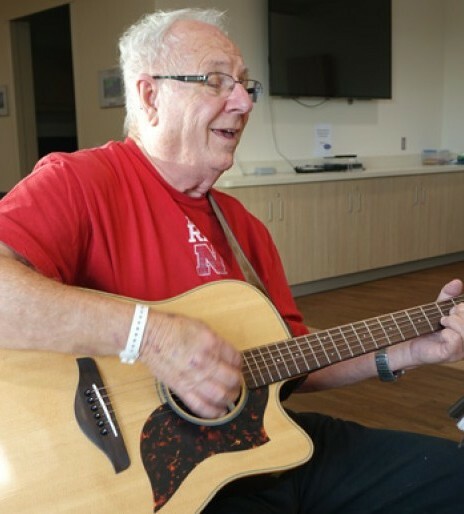 Now Joe says he’s looking forward to a new form of therapy—once again hosting singalongs for patients at local nursing homes. "It’s a humbling experience to have a stroke," said Joe. "I love this place. It was a God send for me to be here,” said Joe. Learn more about Madonna's comprehensive Stroke Rehabilitation programming and resources for individuals with all types of strokes and their families.